Organic and Fair Trade. Award winning Vanilla by Taylor and Colledge. Famous for unparalleled quality and strength. Perfect for home baking or professionals. 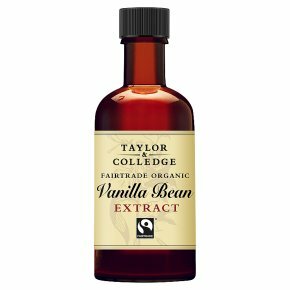 Taylor and Colledge Fairtrade and Organic Vanilla Extract is an award winning vanilla extract, that's been produced for more than a century. Using the finest quality vanilla beans, Taylor and Colledge is famous for its unparalleled quality and strength. Perfect for home made and professional bakes, this rich, vanilla extract is ideal for flavouring custards, puddings and sponges.